The Nationals shut down Stephen Strasburg for the season on Saturday, and in doing so they, by their own account, deferred to lots of nameless medical experts—"the doctors"—who are definitely not just Scott Boras and his junior partners in lab coats. Nope, no sir. "I wasn't asked," Dr. Lewis Yocum told the Los Angeles Times. Yocum said he had not talked with Nationals General Manager Mike Rizzo since last year and had not talked with Strasburg since spring training. Yocum said that, had he been asked, he would not have been able to provide conclusive information about whether Strasburg's long-term health would be best served by shutting him down. "There's no statistic as far as studies," Yocum said. 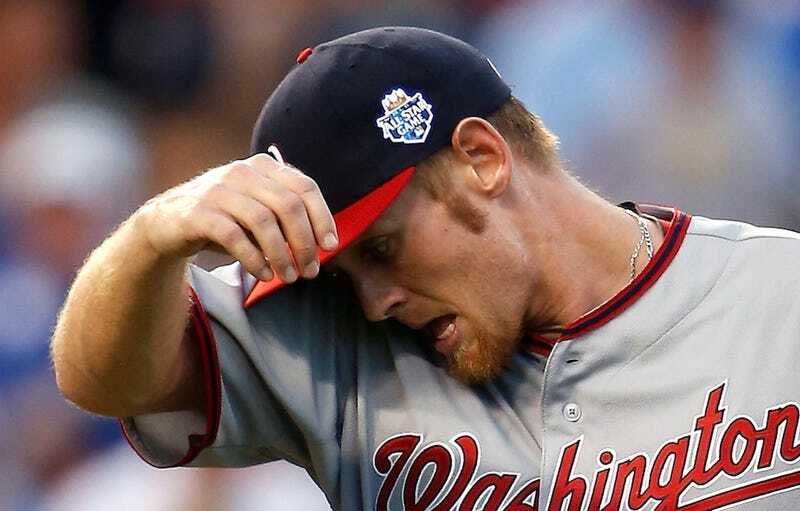 If you're not tired of the Strasburg discussion yet, Rany Jazayerli had a fine piece at Grantland yesterday explaining how the Nationals erred. His point is essentially that MLB has already phased out a lot of the pitfalls that once awaited young pitchers. Shutting Strasburg down won't lead to a meaningfully decreased injury risk, because it's awfully hard to be overused when averaging under 100 pitches per start. Even if you're not won over by Jazayerli's theories about pitcher abuse—and some aren't—there's still this: The bulk of pitcher injuries result from the fact that throwing a baseball very hard is violent and unnatural. Repeating that motion only subjects the body to further trauma. Pitchers can get hurt no matter how carefully they're handled. Most doctors—Yocum included—seem to know this. But whoever's advising Mike Rizzo apparently does not. Update (10:45 p.m.): Yocum says he made all that stuff up. Scott Boras says Yocum made it all up, too. Naturally.